Steve and Alison Anderson were awarded the Wisconsin Maple Syrup Producers Association (WMSPA), Producer of the Year award in January at WMSPA’s annual winter institute in Wausau. The title is awarded each year to honor a producer for their efforts in and promotion of the maple syrup industry. The Anderson family has the distinction of being the only producers in Wisconsin to have three generations of syrup makers awarded the WMSPA Producer of the Year award. Paul Anderson was honored in 1981, Norman Anderson in 1993 and Steve and Alison Anderson in 2014. The Wisconsin Maple Syrup Producers Association is dedicated to improving the ability of its members to produce and market the finest pure maple syrup in North America. The Producer of the Year recipient is chosen from a group of producers who are active in the WMSPA and freely give of their time and ideas to better the association. Anderson’s Maple Syrup, near Cumberland, Wisconsin, has been a family-run business since 1928. In 1928, Paul Anderson began tapping trees and making just enough maple syrup for his family and neighbors to enjoy. As Paul sold more syrup, he relied less on dairy farming for income and in 1957, he turned to syrup making and syrup equipment sales full time. Soon, Paul and his son Norman were running the business together. The Anderson’s began selling syrup making equipment in 1954, when the family became a Leader Evaporator dealer. In the 1970s, the Andersons were at peak production, tapping almost 18,000 trees with buckets on various pieces of land across Wisconsin’s north woods. Norman ran at this capacity for about 10 years while he expanded the business and increased syrup and equipment sales. By 1980, the Andersons were selling far more syrup than they could produce themselves. Norman began purchasing syrup from other local producers who purchased syrup making equipment from him. Anderson’s still operates on this cooperative style of model. Norman hired the company’s first full-time employee in 1974. Norman maintained important sales connections and continued to expand the family business until Steve eventually took over. Though Norman “retired” in 1995, he continues to be very involved with the day-to-day activities of the business. Norman still helps to package syrup and is often consulted when syrup producers come into the store and have questions regarding syrup making. 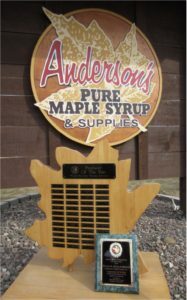 In 2009, Norman Anderson was recognized for his many contributions to the maple syrup industry and was inducted into the American Maple Hall of Fame. Today, Anderson’s modern warehouse sits just across the road from the sugar house where Paul made syrup. With fewer than 10 employees, Anderson’s is still a small, family-run business, but the company now has a national, even global, presence. Steve has increased syrup sales and taken the Anderson’s Maple Syrup label from a regional family staple to a national syrup brand. Anderson’s extensive syrup equipment business has also grown from its humble roots to become one of the largest syrup equipment supply centers in the mid-west.